IBM MobileFirst for Passenger Care lets customer service agents perform booking, re-accommodation and ancillary services sales activities – quickly and easily. IBM MobileFirst for iOS Passenger Care allows customer service agents to perform booking, re-accommodation, and ancillary services sales while interacting with passengers throughout the airport. The app enables agents to address traveler needs from beyond the counter. It untethers them from the desk so they can roam the floors serving customers – offering needed products and services. Passengers get a smoother, more personalized experience. Agents can help speed the check-in process and ease airport congestion. Enable customer service agents to have answers about everything from traveler loyalty levels to ancillary services and products – giving passengers individualized solutions. 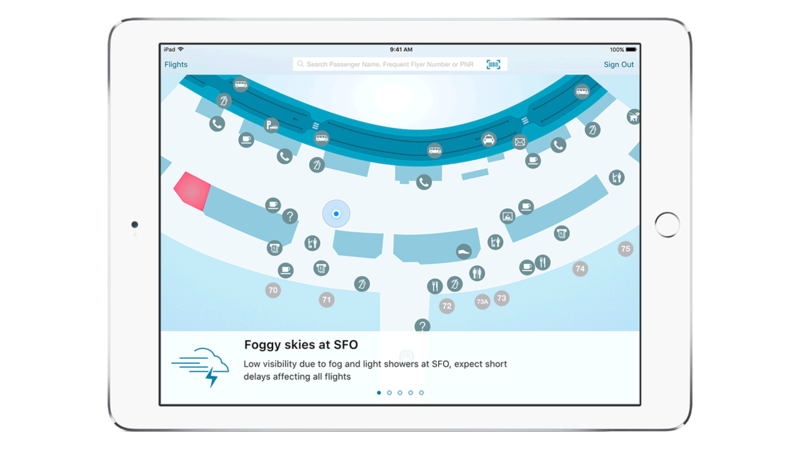 Stay informed with alerts about weather issues, gate changes, task assignments and more – and collaborate with coworkers. Agents can do all these things without being tethered to a counter. Connect with integrated systems of record such as: Transaction Processing Facility, Departure Control Systems, self-service and passenger-processing systems – as well as airline loyalty programs.